Naturally derived and plant-based, Thieves Dish Soap cleans with the power of pure essential oils, leaving dishes sparkling clean with no residue. 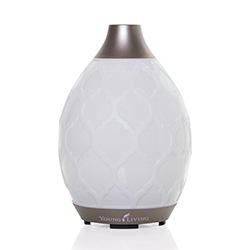 Enhanced with Jade Lemon and Bergamot essential oils, it has a fresh citrus scent that makes daily chores a little brighter. With no sulfates, phosphates, dyes, or perfumes, it’s gentle on your skin and won’t over-dry your hands. 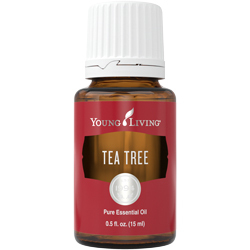 Dispense a small amount of soap with warm running water; add additional soap as needed. 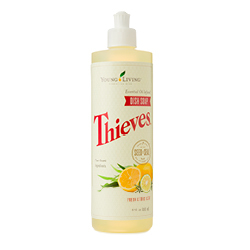 Infused with Thieves, Jade Lemon, and Bergamot essential oils, Thieves Dish Soap makes dishwashing an easy, aromatic experience with a fresh citrus scent and superior cleaning power that won’t over-dry hands. Do not expose to direct sunlight. CAUTIONS: Keep out of reach of children. In case of eye contact, flush thoroughly with water. If swallowed, drink plenty of water to dilute. Do not use in automatic dishwashers. Thieves Dish Soap is designed to easily clean dishes without any harsh or harmful synthetic ingredients, so you can feel good about anyone in the family lending a hand with dish duty. 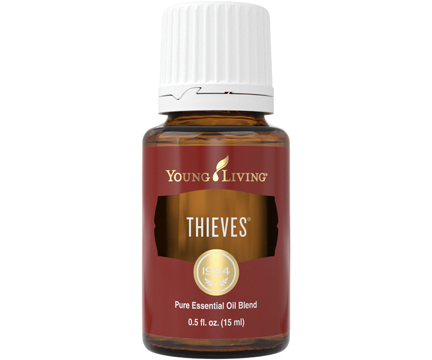 We formulated Thieves Dish Soap with only the highest-quality plant-based ingredients and powered it with 100 percent pure essential oils to make dishes sparkle!